An invaluable guide for both casual opera fans and aficionados, 100 Great Operas is perhaps the most comprehensive and enjoyable volume of opera stories ever written. From La Traviata to Aïda, from Carmen to Don Giovanni, here are the plots of the world’s best-loved operas, told in an engaging, picturesque, and readable manner. 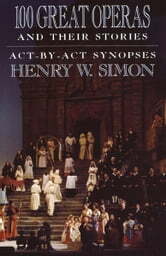 Written by noted opera authority Henry W. Simon, this distinctive reference book contains act-by-act descriptions of 100 operatic works ranging from the historic early seventeenth century masterpieces of Monteverdi to the modern classics of Gian-Carlo Menotti. In addition to highlighting the most important aspects of each opera, the author discusses the main characters, the famous turnings of plot, and the most significant arias. Here, too, is a wealth of anecdotes concerning literary background, past performances and stars, and production problems of the great operas.